irelandsroar | The roar of a Celtic Tiger cub…. Queen Claims to be Head-of-State of Ireland! According to “the official website of the British Monarchy” the queen claims to be head-of-state of Ireland. “Q9. 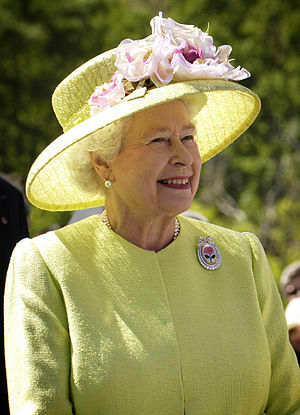 In how many countries is The Queen Head of State? Now as I have discussed here before, the most common definition of the term “British Isles” that is accepted by many, including the British Ordnance Survey, the BBC, the British Council and the European Community Directorate of Translations , includes Ireland. I know very well that the Queen is not head-of-state of Ireland. I don’t believe in this age of mutual respect between our islands that such an inflammatory remark would be made. However, based on the most widely accepted definition of the term “British Isles”, this is what is being claimed! Now we can take this as the definition doesn’t include Ireland, but does this not show how ambiguous and in some regards dangerous this term because of this? Most worrying as not only is this the official site but it called “20 most asked questions”! Can people not see how confusing and misleading this is to, well, everyone, but especially those outside of the UK and Ireland who use the term widely influenced by the BBC and British Council. The British Council promotes the teaching of English widely and includes Ireland clearly in their definition of the “British Isles”, as discussed here previously. This I hope demonstrates why the term should not be used or at least avoided. I hope that you see that when using the term you really have to think is this really what I mean? Is there not a simpler less ambiguous way of stating this? There is; she is head-of-state of the British Islands. As a writer, it is difficult to decide upon the best term to use when referring to ‘these islands’. Picking the wrong term or using a term that causes offense can result in people ignoring your site. Below is a start at a quick and simplistic reference to guide those unaware of which term to use. Ireland – the name of the sovereign country Ireland as defined by the Irish Constitution. It is also the geographical name of the whole island of Ireland. Due to the term being ambiguous, the Irish government introduced the term the Republic of Ireland as a descriptor of the state. Using Ireland has been opposed by some, due to the confusion between the state and the island. The UK government uses the Republic of Ireland or sometimes erroneously the Irish Republic to refer to the country. The Irish Government use the term Republic of Ireland so as to not cause offence in many cases. The EU only uses Ireland to refer to the state. Do not use “Irish Republic” or “Southern Ireland” to refer to the Ireland. Irish Republic – an all-Ireland republic declared in 1916 during the Easter rising in Ireland. It was recognised by the USSR. It was not recognised by the UK government and was superseded by the Irish Free State and Northern Ireland. Republic of Ireland – the descriptor of the sovereign country of Ireland. This term is recognised by the Irish Government and the UK Government. In EU documentation, the term Ireland is used exclusively as the name of the country. Sometimes shortened to the “the Republic”. 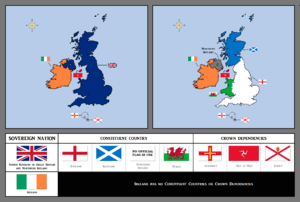 Southern Ireland – the UK proposed partitioning Ireland into two devolved regions of the United Kingdom of Great Britain and Ireland to be known as Northern Ireland and Southern Ireland. This was not acceptable to the Irish people. The region of Southern Ireland never came into existence. It was superseded by the Irish Free State. It is used as a derogatory term for the Republic of Ireland by Unionist and British Nationalists. United Kingdom of Great Britain and Northern Ireland – shortened to UK. 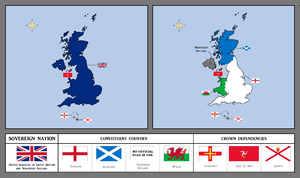 A political designation for the countries England, Scotland, Wales and Northern Ireland. Great Britain – Usually shortened to Britain. Refers to England, Scotland and Wales. British Islands – a legal and political term for the islands linked to the UK, it is defined as England, Scotland, Wales, Northern Ireland, the Isle of Man and the Channel Islands. The British Isles – a geopolitical term with multiple definitions making it ambiguous. Often erroneously used as shorthand term for the islands of Britain and Ireland. The most common definition is the UK, Ireland, Isle of Man and Channel Islands. It is often stated to be a purely geographical term. However, this is erroneous because of the inclusion of the Channel Islands and its historical and current use by the UK government to refer to the islands politically linked to the UK. The current usage by the UK government does not include the Republic Ireland. It is not recognised by the Irish Government and is not used by them. The term causes offense to Irish people when used, especially when Ireland is being referred to. More accurate less ambiguous and less offensive terms can be used e.g. Ireland and the British Islands, British Islands depending upon the groupings of islands that is to be referred to. The term is used extensively by Unionists and British Nationalists, such as the BNP. Feedback most welcome on errors, omissions and mistakes. This post is about the Ordnance Survey claim that the term “British Isles” is a “purely geographical term”. I recently asked them on their blog what was the justification for it being “purely geographical” The Ordnance Surrey maintain that it is not in their remit to discuss the logic of this term, but still insist on using it, promoting its use and describing it as “purely geographical term” despite it clearly not being one. Just because you claim it repeatably, doesn’t make it so! If they defined the term as the islands of Britain, Ireland and the Isle of Man then I would agree it was a geographical term. Note if you define it as the UK, Ireland etc… then it is automatically a geo-political term, as the UK is not a geographical term but a political term defining a country. The addition of the Channel Islands make it a geopolitical term. I would suggest, however, that in this modern age of continued cooperation between our government’s and people that we could be progressive enough to come up with a better term that is not hindered by the political and linguistic problems that this term causes. The ambiguous nature of the term, its continued inaccurate use and extension to political and cultural spheres make me realise the only way forward is to abandon the term and retire it to the dustbin of history. I am not offended by the term, but by its ignorant and lazy use; the term should not be used in this modern age of mutual respect between our islands. There is no need for such a term, certainly outside of purely geographical literature, or justification for its use. There is always a more accurate and less ambiguous term that can be used for the groupings of islands referred to. If it is not in the remit of the Ordnance Survey to comment on this term, then why is it in its remit to define and promote its use? Especially when it is known to cause offence by the way it is used? They are clear about not inaccurately using other terms so as to not offend people, yet they don’t adequatily do so in this case? I see no reason to use this ambigious term unless you are trying to cause offensive. If you disagree please enlighten me. When would be acceptable to use it? Living here in Britain, and in London in particular, it is hard to escape the Olympics. It’s hard to escape the madness around it. I know I was not very happy paying extra council tax for the event. An event I knew I would never attend, but that is life. My tax money was probably spent on a better cause than the majority of the tax I pay. I certainly enjoyed watching the boxing, the only sport I actually know anything about or had an interest in that was in the Olympics. The women’s boxing was a great addtion in my view and their technique and skill was tremendeous. I also could not escape the commotion surrounding the naming of teams. There was the arguments around the ‘Team GB’ Soccer. There was the confusion, again with the soccer, around the North Korean team and the South Korean team. Then there was the argument around the name ‘Team GB’ itself. There were claims that the ‘team GB’ name wasn’t inclusive because it did not include the UK region of Northern Ireland. There has been calls by the devolved government in Northern Ireland for the name to be changed. For example, Gregory Campbell of the DUP made the argument that the name was not inclusive as the full name of the team, team Great Britain and Northern Ireland, is always shortened to ‘Team GB’. The British Olympic committee use ‘Team GB’ officially in all of their branding. He maintains that team name should be team UK, as this would include the Channel Islands and the Isle of Man. However, team UK would not include the Isle of Man nor would it include the Channel Islands. Both of these Islands are Crown Dependencies, but are not part of the UK or the EU, although they hold British passports. 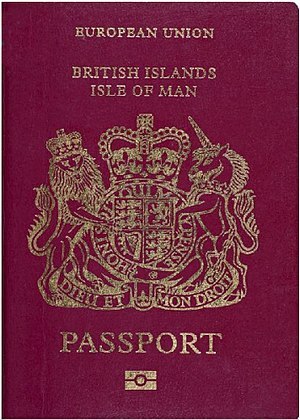 These passports are stamped with the name British Islands on them. So what would an appropriate name be? The most accurate would be team British Islands. The British Islands is defined as the UK, Channel Islands and the Isle of Man in the aptly named “Interpretation Act 1978, CHAPTER 30”. This has the advantage of being a legally defined term that is inclusive of the regions that are represented by the current ‘Team GB’. The British Islands is rarely defined in style guides or used in publications. This is suprising because it is a very usful term. The question is when will the British Goverment sort out the mess surrounding naming things and actually follow their own definations of terms. When they, or others, don’t, someone gets offended. i*spy gets it wrong on FAs. I was once told by a foreign restaurant owner, near where I lived in Ireland, that Irish people don’t complain. They just smile politely, saying everything was great, leave and never come back. He didn’t understand that mentality. ‘Bad’ restaurants then can’t change without their customers feedback and because we vote with our feet they go out of business not knowing what they had done wrong. I think this is the approach we have taken. We get offended when we are referred to as the “British Isles” so we vote with our feet. It is interesting to point out that subscription based services don’t tend to us the term “British Isles”. Indeed, the National Geographic changed their policy and now no longer use this term to refer to the Ireland after a complaint by an Irish Lobbying Group in America. There are some exceptions, when contacted Geograph Project agreed that the term was inappropriate and have agreed to use an alternative wording. Geograph Project, thank you for your support and understanding. It has become the preserve of groups and bodies that have no commercial interest in Ireland, or do not sell something to Ireland. The BBC falls into to this category, as does the British Ordnance Survey. Neither entity is funded from Ireland, as Ireland has its own national broadcaster and its own ordnance survey. 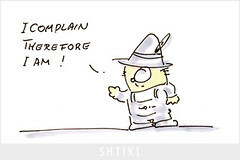 Well, then all one is left with is complaining. So that is what I have been doing, and learning on the way. Starting with the BBC and moving on and on. If you notice anything online, or want to help or show support, don’t hesitate to contact me via the comments on the site (you can put your email on it if you wish me to contact you). I won’t approve any comments you don’t wish me to or any comments with an email address, so don’t worry about getting spammed. Is there ever a use for the term “British Isles”? In this Blog I have made my dislike of the term “British Isles” patent. I have discussed before about the ambiguous nature of this term, and particularly how it used inaccurately by the BBC. Here I will discuss its use by the British Government, and alternatives used for this term by them, in legal documentation. The term “British Isles” is ambiguous. Not just the use of it by the BBC, but its use by many companies and institutions. For example, when the British Government use the term, you can pick up from the context that they do not refer to Ireland. As, on occasion where they wish to extend something to include Ireland, they explicitly state the “British Isles and Ireland”. The British Government, therefore, are instead referring to the UK, Isle of Man and Channel Islands as the “British Isles”. This definition is somewhat less objectionable, but still ambiguous when used. There is, however, a legally defined term defined by the British Government for the UK, channel Islands and the Isle of Man, in the aptly named “Interpretation Act 1978, CHAPTER 30”, which defines the “British Islands” as: “..the United Kingdom, the Channel Islands and the Isle of Man. ”. Now that term is way better, because (1) it is well defined and (2) it does not suffer from the linguistic difficulties that the term “British Isles” does i.e. implying that Ireland is somehow “British”. Therefore, you can avoid all ambiguity by referring to Ireland and the British Islands or vice versa if you need to. May I also suggest that the British Government consistently use the term. Instead of increasingly using the term “British Isles” as a synonym for the British Islands. I recently gave feedback to the complaints department of the BBC about the use of the term “British Isles”. My argument was that the term is ambiguous at best and offensive at worst. As such, I suggested that the BBC should avoid using the term, as in most cases they are not using it accurately, as per their own style guide (definition on page 39). The BBC initially informed me that the term was a “geographical designation” with no “insulting undertones” and that their audience understood its meaning. However, a simple glance at the comments left by the BBC’s audience clearly shows that they are confused about what the term really means. Further, a subsequent email from the BBC confirms that the BBC are aware that it is found to be offensive by some and the BBC’s own style guide admits that the situation surrounding the names of countries and regions is “confusing”. This is further complicated by the BBC’s writers not using the term consistently or accurately; using it to mean some changeable sub-set of groupings of islands. This term causes offence because it is an archaic term that can be interpreted to imply that Ireland is somehow British (despite what British people maintain about its definition). However, if you used it as purely a geographical term and accurately you can avoid the vast majority of offence that can be caused by it and make your articles more accurate and less ambiguous. Firstly, if it is a “geographical designation” then it should be used in purely a geographical setting and not used in articles regarding politics, people or culture. When it is not used in a purely geographical setting then it implies that there is one homogeneous culture on these islands and that we all have one homogeneous view. This is clearly not the case. Further, in political and royal matters it is increasingly problematic because it implies that typically the British government or the royal family are speaking and ruling in the Republic, again this erroneous and can cause controversy. Secondly, the term should only be used when it is actually referring to your definition in the style guide and not used when referring to sub-sets of these islands. This is where it causes most offense and is most problematic, especially because it is used to mean different things by different authors. I notice in your style guide some very sensible advice about not alienating or using terms that would offend people from non-London regions of the UK. May I suggest that you extended this respect to your nearest neighbours in Ireland and stop using this archaic term, or at least use it accurately and in a purely geographical setting so as to stop misleading your audience. I am aware that you do not “ban” words, but insisting on the word being used strictly as in your definition would go along way. I don’t think asking for the BBC to be accurate and precise in its language, especially when it can avoid offence, that it is aware it can cause, is too much to ask. What does the BBC say about the ambiguous and offensive term the “British Isles”? I searched for their style guide and found it after some googleing. “The British Isles is not a political entity. It is a geographical unit, the archipelago off the west coast of continental Europe covering Scotland,Wales, England, Northern Ireland, the Republic of Ireland, the Isle of Man and the Channel Islands. Note the last line is actually in the manual! Hmmm. The Republic of Ireland is in the British Isles? Really? The BBC’s own readership, never mind the BBC’s writers, are confused on this one. Just take a look below at comments made by the BBC’s audience in its own site forums! (if you wish to complain to the BBC about their use of the term “British Isles” then follow this link. If you get an interesting response you can share it in the comments below or send it to me). “redheylin (24) – Yep, I saw that. But the ‘Britsh Isles’ is a very outmoded term. The Republic of Ireland is not British and the Channel Islands are an really an archipelago more geographically associated with the coast of Normandy (France) rather than part of the British Isles. I like this one. I wish I was articulate and smart enough to make my point so concisely. In fairness, the following post, in response to someone who is unsure, agrees with the BBC’s own style guide. “Horse; I’ve no idea if it’s ‘official’ but at school (waaaaay too long ago) we were told that’Great Britain’ is England, Wales & Scotland; ‘United Kingdom’ adds Northern Ireland to those three (as in the UK Passport mentioning ‘United Kingdom of Great Britain & Northern Ireland’); ‘British Isles’ then adds Eire [sic] to the UK. P.S. it’s spelt Éire. That’s a fada over the ‘e’ (press and hold ALT-GR SHIFT and any vowel to put a fada over it on any keyboard in the UK or Ireland). In fairness to the above, the naming of the Irish state is confusing. Éire should only be used to refer to Ireland in the Irish medium. The English is Ireland, or after the Republic of Ireland act, the Republic of Ireland is an acceptable description of the state, but not Irish Republic. The Irish Republic was a 32 county, all-Ireland republic declared in 1916, that the IRA are trying to obtain. Understandably, Éire is used in the UK in everyday speech by many (I have not seen or heard it used else where) for the Republic of Ireland to distinguish it from the island of Ireland (which includes Northern Ireland). This is just one of the numerous arguments in the BBC’s forums that I could pick. Every page where they use the term British Isles, or Great Britain to mean the UK, you find comments usually in the forum demonstrating this confusion. The coverage of the Olympic’s, especially the UK’s Olympic Football team, lead to much confusion. I respect the author’s attempt to try and make clear that the Republic of Ireland is not part of the “British Isles”, but this is the second point where the article is inaccurate according the BBC’s own style guide. From talking to Irish people, this is what most of them think the British mean when they use the term “British Isles” i.e. it doesn’t include the Republic of Ireland. As such, they ignore the term, as it doesn’t relate to them. The only way forward is to stop using the term and leave it to gather dust in some archive. The BBC needs to show that it is big enough to be the first to move on this. I hope I have made my point that the term “British Isles” is confusing and ambiguous and that the BBC’s own audience find it ambiguous (as evidenced by their own comments). Further, the BBC’s own writers use it to mean what ever they happen to like it to mean. It is therefore neither accurate nor precise. So why use it? Unless you are trying to be offensive? How could the BBC, and everyone else, avoid this mess? Simple. Avoid the term “British Isles” and use a more appropriate, less ambiguous and less offensive term to refer to the groupings that they wish to. Most of the time this term is used, it is used inaccurately. In the case of the BBC, violating their Editorial Guidance (e.g. section 1.2.2) and making them look like ignorant twits that don’t know the boundaries of their own country. I suggest that they adapt their style guide to reflect this, including guidance on what terms and when to use them. A paragraph added to page 39 would suffice. I suppose that is what pisses me off most about it, they don’t ever need to use the term, ever. I know I can’t find a situation where it was needed and an alternative term wasn’t easier or more accurate to use. There is always a better term that the “British Isles”.